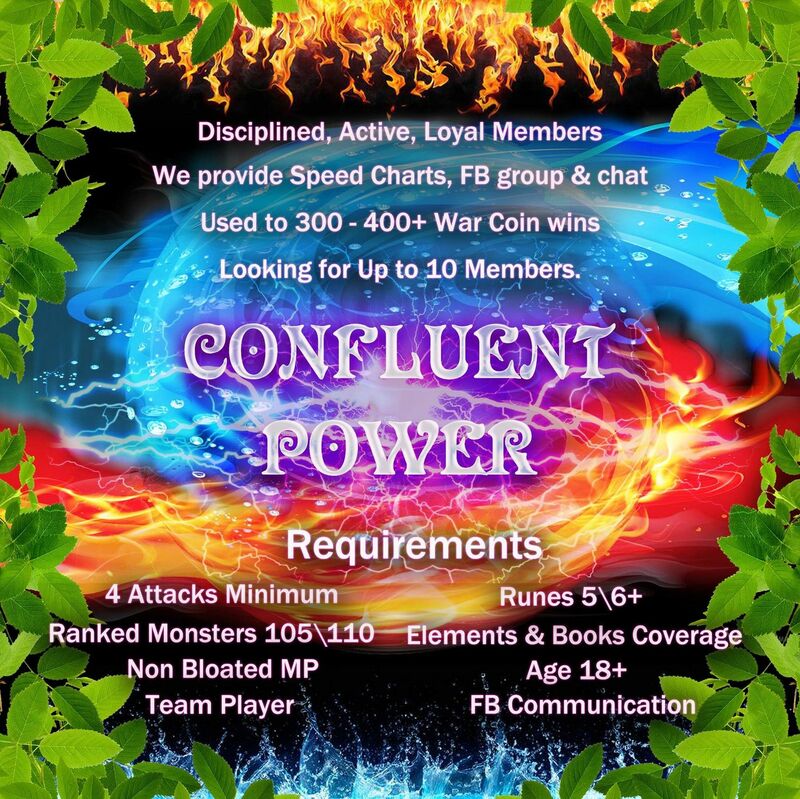 Confluent Power is rebuilding and looking for members. We started out as Terror Kings. I joined that team that was a low level team, introduced speed sheets that I MADE from scratch, and strategies, wrote rune guides and best monster guides and every war I would write a defense post, help people select their best defense and rune setups. With them they took the speed sheets and guides I made and distributed them among the apocalyptic family. Apocalyptics built and improved these sheets, no doubt. But they originated from us. I have no beef with apocalyptics anymore, but this is a fact. We also, back then, made a sister team "Terror Knights" to whom I also gave my speed sheets and guided sometimes. The team was then led by Ryan Martin aka Pope. They then became Black Flag ,and now known as The Friction, after Pope retired. Things were going great for us for a year plus as Tenacious Kingdom, till i decided to take some time off and handed the team to my colead and supposed friend. After Sp started making some positive changes I came back and was treated like a stranger by the coleads (who i recruited in the first place). It was a hard pill to swallow but I stepped down from lead to my friend to keep us all together. We reformed as Confluent Power. Then my colead/friend who was now lead, and whom I stepped aside for, decides he wants to retire few wars in! Drama ensues because i ask for lead back, and get ignored, and it ends up with this colead suddenly NOT wanting to retire anymore and instead forms his own team. Whole thing was pointless I was fine with him leading because I valued the team more than my ego, but was not fine with not getting it back when he retires. Then some split from us and start luring people away using the same stuff I built that made us unique in the first place. Good for them. Running down on members we try to merge with another team. We end up with mostly slackers and indifferent players and their cos who were supposed to stay and help us, dump them and disappear. We got 2 good players from the deal who are still with us now. We are players short. We need people or a decent team that wants to merge with us. Writing silly gimmicky recruiting posts and poems is not my thing. Using half naked chicks in my recruiting posts for attention is not my thing. Flaunting the effort of someone else as if my own is not my thing. So I am being real here. We are a good team! We have good people who have stuck by me for over 2 years now. We plan ahead for races and win with minimal cost. We are not big spenders. We are not that chatty because we all have lives and work, we are not that rich, you won't get 200 elementium from us in frat, we are not that stupid to give away timerion and voltaik cells freely to new members. -At least a lead who is deeply passionate about the game. Players who know what the heck they are doing runes wise. -Players who will do their best in war but a lead who understands not to cut their head if sometimes they fail to deliver. I have been knocked down and betrayed so many times in this game but I am still fighting for my team. I still have a lot of passion for this game. So join us, the originals, not the copy cats. Join us the ones who built ourselves up from scratch not those who got handed things on a silver platter. Help us rebuild this team that so many others branched from.